On Thursday 9 January, the Friends of the Personal Ordinariate of Our Lady of Walsingham held their annual candlelit Epiphany Carol Service at Our Lady of the Assumption and St Gregory’s Church, Warwick Street (London, W1). The Service was led by the Ordinary of the Personal Ordinariate, Monsignor Keith Newton, and featured readings drawn from British Christian classics as well as seasonal lessons from the Scriptures. The Service concluded with Benediction of the Blessed Sacrament and prayers of thanksgiving for the establishment of the Personal Ordinariate, which was founded nearly three years ago to the day. Guest readers at the Carol Service included the journalist, Christopher Howse, politician, Sir Edward Leigh MP, and Headmaster of the Cardinal Vaughan Memorial School, Paul Stubbings. 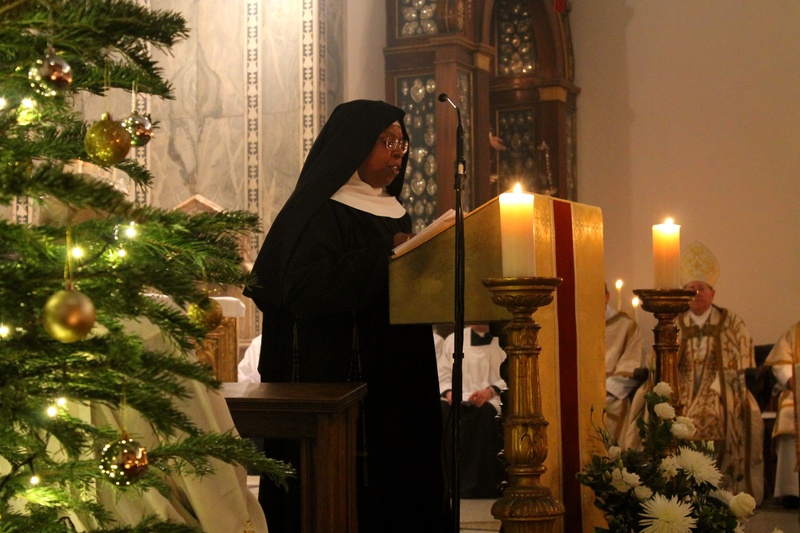 In a change to the advertised programme, Mother Winsome of the newly erected Ordinariate monastery of the Sisters of the Blessed Virgin Mary travelled especially to the event to read G K Chesterton’s The Wise Men. The Gospel readings were read by Ordinariate clergy, including Fr David Skeoch, Mgr John Broadhurst, and the Ordinary. During a short address, Mgr Newton thanked all present, especially the Friends, for supporting the work and mission of the Ordinariate. He also welcomed the many guests who were there for the event, and spoke of the great joy he felt in welcoming Mother Winsome to the Service, especially as he had only just erected the monastery to which she belongs on 1 January. Music was provided by the highly acclaimed Schola Cantorum of the Cardinal Vaughan Memorial School and its Organist, Iestyn Evans, under the direction of its Director of Music, Scott Price. The music included Eric Whitacre’s Lux Arumque and Adolphe Adam’s O Holy Night. Following the Carol Service, all present were invited to the parish rooms for refreshments, which included wine, mince pies, and ‘galettes des rois’ – the famous French Epiphany cakes.